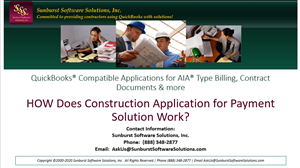 Construction Application for Payment Solution works with QuickBooks® to provide a complete AIA type billing solution for General Contractors, Sub-contractors, Builders, and Developers; to help you create Percentage of Completion contract billings on actual AIA G-702 & G-703 documents or similar plain paper forms,without time-consuming data entry. QuickBooks holds basic information about your customers and the job you are working on, Estimates(Scheduled Values), and Progress Invoices (current Accounts Receivable and Work Completed this period) information. It can, also, track Retainage Payable and/or Retainage Receivable. Construction Application for Payment Solution (CAPS) holds additional project information, architect information, retainage methods, percentage of completion calculations, and account for stored materials in liked drecords. Information in both programs is then merged together to geneerate the following final billings and documents-without time-consuming duplicate data entry. When used in conjunction with QuickBooks, Sunburst Software Solutions, Inc.'s Construction Application for Payment Solution will broaden and enhance the QuickBooks end-user experience, as well as, their return on investment; allowing for timely delivery of complex billings and the generation of key Contract Documents. Construction Application for Payment Solution has proven to increase billing accuracy and reduce billing efforts up to 95%: effectively turning hours of work into minutes. AIA G-702 Contractor Application for Payment and G-703 Continuation Sheet. AIA G-702 CMa Construction Managers and Advisors edition and G-703 Continuation Sheet. AIA G-706 Contractor's Affidavit of Payment of Debts and Claims. AIA G-706A Contractor's Affidavit of Release of Liens. AIA G-707 Consent of Surety to Final Payment. AIA G707A Consent of Surety to Reduction in or Partial Release of Retainage. Several variations of the standard G-702 and G-703 - see theAIA G-702 & G-703 Billing for QuickBooks Demonstration & Sample Forms page for a complete listing of full-sized sample forms in .pdf format. Retainaage Requisition with or without a Continuation Sheet. Negative/Credit Application for Payment and Continuation Sheet on either original AIA documents or plain paper. Billing Sheet to help with next month's billing. Round lines 4-8 on the G-702 to the nearest dollar. Set "Defaults" for retainage methods and forms to print. Ability to adjust Line 7 of the G-702 in prior periods. Add Subtotals, Page Totals, Running Totals, or Page Breaks after line items of your choice, on the Continuation Sheet. Save completed Applications in a folder of your choice, in Excel format, after previewing or printing. Using the built-in Contract Document Manager, you can generate the following customizable plain paper contract documents (which are digitally signed) or design your own specialized documents. AIA G706- Contractor's Affidavit of Payment of Debts and Claims - complete document on plain paper. 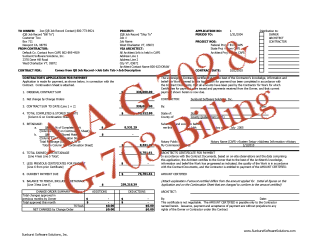 AIA G706A - Contractor's Affidavit of Release of Liens - complete document on plain paper. AIA G707 - Consent of Surety to Final Payment - complete document on plain paper. AIA G707A - Consent of Surety to Reduction in or Partial Release of Retainage - complete document on plain paper. Design your own specialized documents quickly and easily. Save the completed Contract documents to a folder of your choice after printing. Free 30-day trial available upon request. How Does Construction Application for Payment Solution work? Watch a 10 minute video on how Construction Application for Payment Solution interfaces with QuickBooks by clicking on the video to the left. Priced at $295.00 for a Construction Application for Payment Solution "company license", with the program to be installed on as many computers as required - via electronic download (CD's, printed manuals, shipping are extra - see our Order Page for more details). and create Progress Invoices from the estimate. Add Project information to the "Ship To" Address Block of the QuickBooks Job Record. Edit the QuickBooks Job & Estimates Preference and make sure that the option for "Don't print items that have zero amount" is not checked. There may be NO subtotal lines within your Estimate. You cannot issue QuickBooks Credit Memos and expect CAPS to recognize them as Negative Change Orders. Download a pdf Construction Application for Payment Solution brochure (317 KB) . If you haven't yet viewed the on-line demonstration, which provides an overview of how Construction Application for Payment Solution interfaces with QuickBooks, and is suitable for training, please go to our AIA G-702 & G-703 Billing for QuickBooks Demonstration & Sample Forms page.